The dedicated satnav device is under attack. Almost every smartphone and tablet under the sun now offers some kind of navigation functionality. What hope, then, for the TomTom GO 6000, the biggest and boldest member of TomTom's new GO range? Not only does it have to beat an Apple iPhone 5S or Samsung Galaxy S4 at navigation. It has to justify a price premium over its TomTom GO 5000 sibling and take on the likes of the Garmin nuvi 3598LMT-D, too. Youch. But here's the thing. The TomTom GO 6000 aims to distill the satnav down to the what's really important for getting from A to B. And do it far better than any smartphone. The TomTom GO 6000 is the biggie of the new GO range. It slots into the same clever magnetic cradle as the TomTom GO 5000, for instance. But at 169mm across and 292g all told, it's a much bigger beast than the 145mm, 229g. In most other regards, it conforms to the new TomTom GO design ethic, which is to say reasonably slick in its black and dark-grey threads if teetering on the fine line between functional and anonymous. You can forget your 1080p, QHD and 4K mega screens. The TomTom GO 6000 sports an altogether more mundane 800 x 480-pixel six-inch LCD panel. However, that's still a big step up from the smaller TomTom GO 5000's 480 x 272-pixels and a dead heat with the premium nav competition, including the Garmin's nuvi 3598LMT-D. 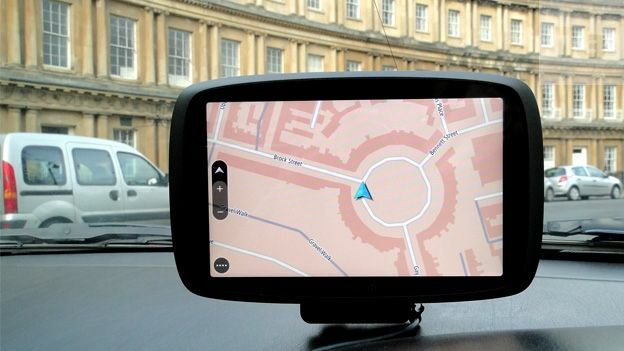 Put simply, uber-res isn't a massive issue for standalone satnav devices. However, one smartphone feature that has made the jump is capacitive touch, so we're pleased to see TomTom providing just that. As for connectivity and internet-enabled functionality, there's an interesting shift taking place. Gone are smartphone-aping pretensions, Google searching and all that jazz. Instead, the TomTom GO 6000 does have a data connection, but it's there for pure nav functionality like traffic data and speed camera locations. However, the TomTom GO 6000 is still connected to the internet. It's just you don't have to worry about paying for a data connection. Instead, it's always connected, even abroad (25 European countries currently), for traffic data and TomTom's speed camera database. The only catch is that the speed camera data is only free for the first three months. Thereafter it's £19.99 a year. As for the peripheral features, the TomTom GO 6000 comes with a 12V power adapter that can also power any standard USB device and a cradle complete with suction cup. First up, the TomTom GO 6000's capacitive touchscreen will be a blessed relief if you're used to resistive screens in nav devices. It's just so much more responsive. The design of the interface helps, too. TomTom has cut out all the chaff and phaff. What's left is a purer, simpler and downright quicker navigation machine. The stuff that really matters - inputting destinations, finding parking and petrol stations - couldn't be easier or quicker to access. At most it's a tap, a swipe and a tap. Anything not directly related to efficient navigation is either gone or relegated to a suitably low-priority location in the interface. There's admirably little cluttering things up or slowing things down. The generous six-inch screen size and clean, polished graphics help here, too. Overall, it's a very pleasant device to use. Does 3D mapping actually matter? Is it any clearer or more legible? These are probably subjective matters. But at least the TomTom GO 6000 renders its 3D graphics smoothly. Ditto the alternative top-down 2D view, which we actually favour for legibility. We also like the parking and petrol station navigation, which actually uses location pins on the map, allowing you to see where they are and pick one. Previously, TomToms used to offer up a text list of parking or petrol options with distances that were often misleading and gave you no real idea where they were in relation to your current position. This new map-based approach is infinitely better and just one example of how TomTom has rethought and simplified the whole navigation experience and made it faster, more efficient and more effective. As for the quality of the maps, this has always been one of TomTom's strengths and our time with the TomTom GO 6000 hasn't changed that view. Mapping is accurate and the navigation cues and guidance are about as clear as they come. That said, we have very minor reservations with regards to the new map graphics for some navigation cues. This kind of thing is very subjective, but we found following guidance off large roundabouts a bit trickier than old-style TomToms. Perhaps familiarity will cure that one. Finally, it's worth noting that you get European maps covering 45 countries and up to four country map updates per year for free. Just when you thought dedicated satnavs were dying, TomTom has seriously upped its game. In many ways, the TomTom GO 6000 along with its new GO-series gets back to basics. All the smartphone-aping, internet and app-enabled nonsense is gone. There's still a data connection, but you don't have to worry about paying for it and it's only used for the really important things, like HD traffic and speed cameras (albeit the speed camera data is actually a premium service. We love the new, cleaner and quicker interface and super-repsonsive touchscreen. The new-look maps are great too. OK, the 3D functionality is probably a gimmick, but there's a traditional 2D mode so it's win-win. Even the new cradle and the way the device itself snaps in and out magnetically speaks volumes about the attention TomTom has paid to optimising and improving every single aspect. TomTom was under pressure to raise the bar. It's done just that. However, £299 is still on the pricey side, especially when you add in the extra 19 quid a year subscription for speed camera info.